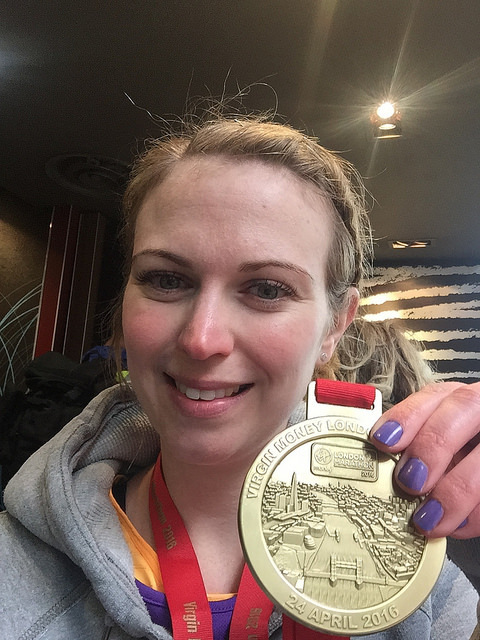 Hopefully you’ve read Part 1 of my London Marathon experience. If not, it’s probably worth having a quick glance over before reading this post. So, I was finally there, all ready to go. I felt good, but deep down was a little anxious about whether my recent foot injury would actually hold up enough for me to get over that elusive finish line. I was surprised how quick the race got going and my offcial race stats say I crossed the start at 10.14am, 14 minutes after the race began, which is quite good, athough I perhaps shouldn’t be surprised as the race was so well organised. Simon rang me as I was just heading over the start to inform me that he was just crossing over too. We were meeting just after 3 miles, so needed to try and go at the same pace to ensure one of us wouldn’t be waiting too long. The atmosphere was amazing, lots of supporters cheering us on right from the very start. I had a quick look at my watch to check my pace as everyone goes on about not starting too fast and I can now see why, I was running at just under 10 min miles (I was aiming for around 11 min miles) and I hardly felt like I was running. It’s so easy to get carried away with the atmosphere. Around the 1 mile mark, I really needed a wee again! There was a sign saying that toilets were 200m away, so I tried to call Simon. No answer! Not great as I wanted to warn him so that he could slow down. I decided to stop and queue (it took about 5 mins) and kept calling him whilst I was queuing but he didn’t answer. After my loo stop, I picked up my pace a little, but consciously tried to keep it steady. Just after I passed the 2 mile marker, Simon rang. “I’m at 3 miles!”. I told him to slow down and do lots of stretching, he said he’d wait for me. I’d been stressing a little about meeting up amongst so many people, but it was fine. It was busy, but it wasn’t ridiculous. The one thing that I was really surprised about was the amount of empty water and lucozade bottles that were all over the roads. I was a worried about tripping on one, so had to consciously dodge them as I was running. At around 4 miles we both had our energy gels as planned. I was feeling good, my foot was fine. The atmosphere was amazing. It was around this point that I started speaking to a lovely local lady. 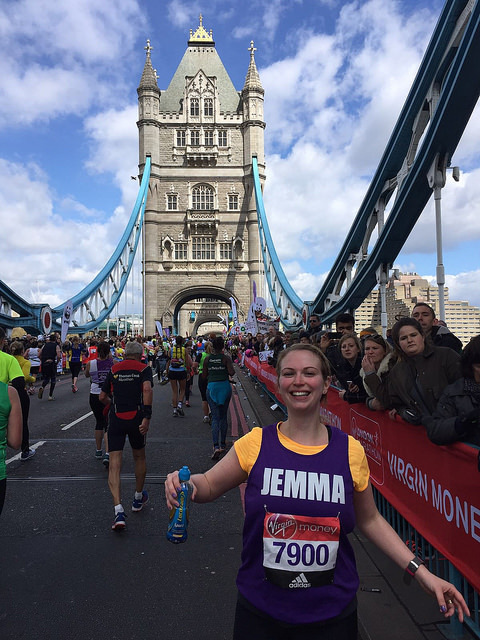 She’d recognised my running vest and was aware of me due to the social media updates from the local charity (Forever Stars, a charity set up by our friends, following the stillbirth of their baby girl) that I was running for. She was also running for a baby loss charity. We chatting for a bit and she shared that she had been pregnant twins, around the same time I was pregnant with Henry and Heidi, but one of them didn’t make it. We chatted about our kids. It was emotional but lovely. After a while, we wished each other luck and she ran on ahead. 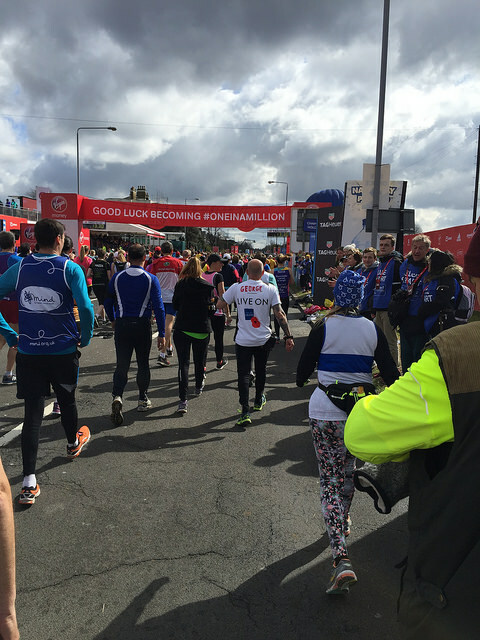 One of the best things about the London Marathon is how evident the strength of the human spirit is. Along the whole 26.2 miles, there are supporters, all cheering and supporting. People were shouting out my name and willing me on like they really wanted me to succeed. I think that in England, generally people are often negative and aren’t overly supportive, particularly of those who appear to be winning at this crazy thing called life. But at the London Marathon that is all turned on it’s head. It makes me emotional to think about it. It’s just amazing and such a wonderful thing to experience. The miles seemed to pass by really quickly. 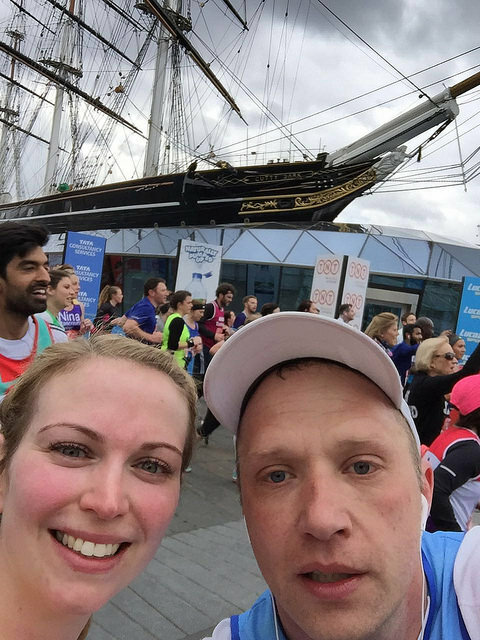 We reached the Cutty Sark around mile 6, which was brilliant. The crowds were really big around here and the support was amazing. We managed a quick selfie stop before we continued on our way. I think it was probably around this point that I started to feel my injured foot niggling a little. Although, I’d taped it up, so I couldn’t be sure if it was the tightness of my tape as my foot swelled. Thankfully after a couple of miles it eased and although my foot was bruised and sore at the end, my weeks of worry were uncalled for as it held out! We knew that Simon’s parents and Oscar were waiting at mile 11, so after we had another energy gel at mile 8 we focused on seeing them. I think we had a little walk as we were running quite fast and as my foot was niggling I wanted to take it steady early on. It was amazing when we finally spotted them. We stopped for hugs and sweets (wasn’t keen on trying to chomp on a haribo whilst running if I’m honest!) and feeling re-energised we were on our way. My lovely boss at work had come down for the weekend with her friend so that she could see us. I’d rang her just before seeing Oscar and she was around the 11.5 mile mark. She wasn’t quite so easy to find and I was worried that we’d missed her. Finally we saw her. Another quick stop for hugs and photo’s! By this point I was feeling amazing. I wasn’t tired and was high on emotion and atmosphere. Not long after came the bit I’d been really looking forward to – Tower Bridge. I’m delighted to say it was every bit as amazing as I’d imagined. Lots of people and just stunning. We had a little walk at this point to allow us to take in the atmosphere and get those all important pics. I think this bit was definitely my favourite bit of the whole marathon. 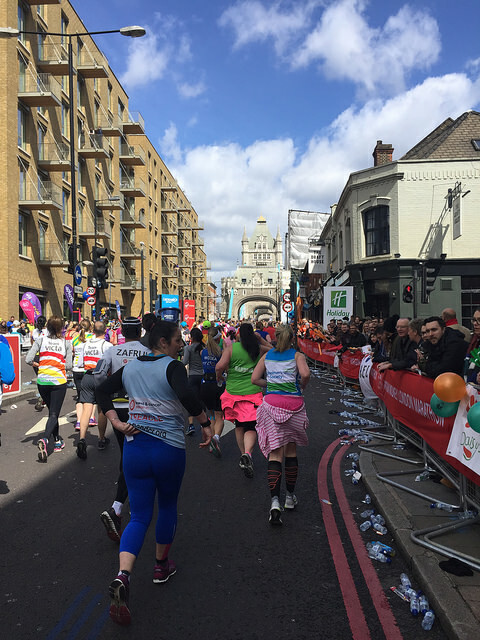 It’s probably a good job that Tower Bridge is fab, just after you turn right, but if you look to the left you see other runners who are around the 22 mile mark. They’re running fast and you know that they are about 9 miles ahead of you. Definitely a bit of a low moment. All that seperates you from them is a piece of tape. Although I would never ever cheat, Simon and I had a chat wondering how many people had cheated. In fact we later found out that the sister of someone from Towie actually did just this at some point during the day – there really are no words!! We had planned to see my parents and the twins at around the 15 miles mark. However, after calling them a few times we realised that they weren’t able to get there. Not great news, as looking forward to seeing people you know along the route really keeps you going as it gives you something to focus on that isn’t too far away. Our next focus was to see Simon’s parents and Oscar once again at mile 17. At around the 16 mile mark my left knee started to hurt and the back of my left leg started to feel tight. The miles were starting to feel longer, I took energy gels but can’t really remember taking them. I remember running on sticky roads after we passed gel stations and I remember gripping my bottle of Lucozade like it was a life line! 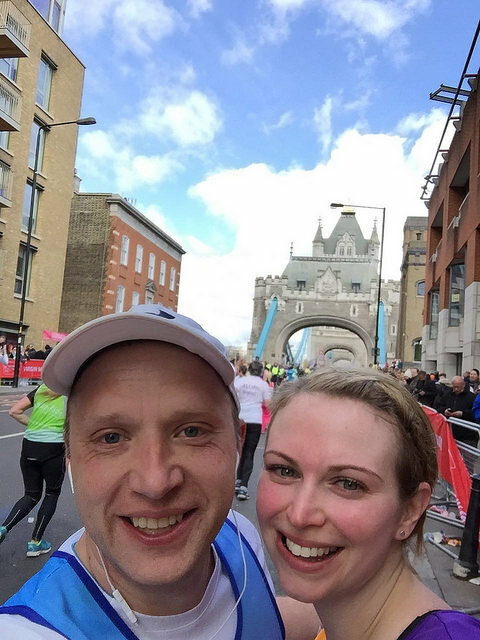 When we saw them at mile 17, I decided to take a couple of paracetamol to help with my knee. Again there were lots of hugs and we chatted to them for a little bit. We then went on our way, knowing that we were going to see my parents and the twins at mile 18, who were waiting just outside our hotel. It was amazing to see them. The twins both had little signs and were so excited. The people they were standing next to gave us jelly babies (much easier to get down than Haribo!). A few more hugs and kisses and we were on our way. Around this point Simon started to struggle a little, so we did a bit of walking. He did lots of stretching, but my legs felt completely odd at this point and stretching just felt all wrong. I just needed to keep my legs moving. I didn’t really enjoy this point of the route much. I remember Canary Wharf being impressive, but then it seemed really industrial. I just kept focusing on getting to that 20 mile marker. I kept thinking once we get there, we’ve only got 10k to go! When we hit 20 miles, the miles seemed to get longer. My knee was really hurting at this point and I was exhausted. We did lots of run/walking. I remember mile 22-23 feeling like it took forever. It really was time to dig deep. Simon was doing okay by this point. He said he’d carry me to the end if needed. I wasn’t that bad. Quitting never entered my head, I just knew that I needed to take it steady to make sure I got to the end. I’d expected around this point to see lots of ill-looking people. Previous marathoners had warned me to expect scenes of carnage around mile 23, but I don’t remember seeing any. Simon said that there were a few ill people, but I was so focused on just getting to the end that I think my mind just didn’t allow me to see them. 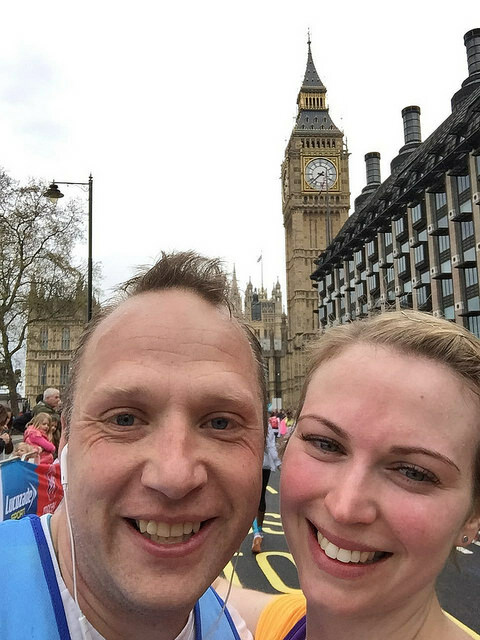 We later found out that, soldier, Captain David Smeath, had collapsed at mile 23 and later died. This had taken place around 2 hours before we got to that point, so we didn’t see anything, but it really is tragic. 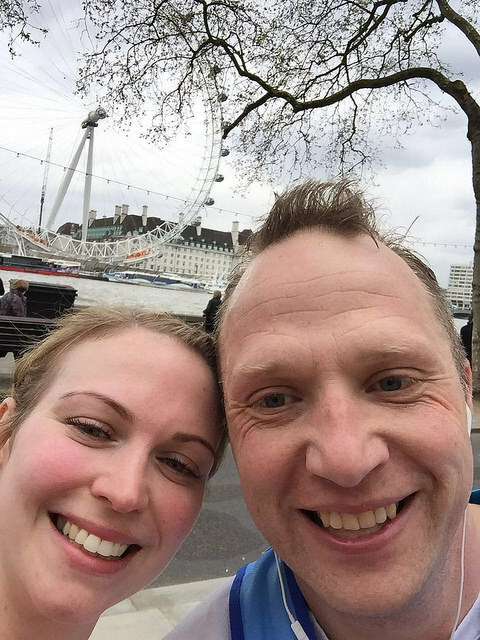 I’d been really looking forward to seeing all the sites as we ran the final few miles along the embankment, but I didn’t really enjoy that bit as I was so exhausted. We saw Simon’s parents and Oscar at some point during this stretch, but I don’t think we were with them very long as we wanted just to get it done. Simon also forced me to have a couple of selfies. At the time I wasn’t keen, but I’m so glad he did now. I remember running through a horrid tunnel, seeing Big Ben and then turning on to the Mall. I remember seeing the 1K to go sign, but rather than feeling elated, I remember thinking that it seemed so far to! My stomach was bloated and uncomfortable, which I think may have been the two bottles of Lucozade that I’d consumed on the way round or maybe it was just in shock! My whole body felt like it belonged to someone else. 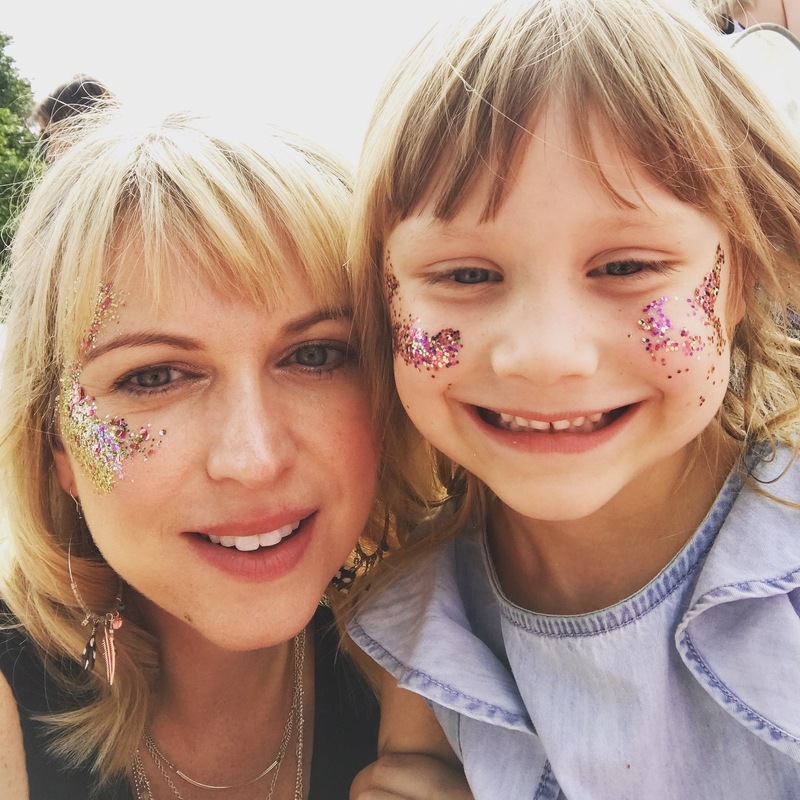 I really had hoped to enjoy the final bit more, but at the time I just wanted to get over that finish line, which we finally did – we ran the last bit and went over hand in hand! Amazing, I’d done it! Being handed that medal was one of those moments in my life that I’ll never forget. After months of training, weeks of worrying about my injured foot and mental anxiety about whether I actually had it in me, I’d bloody well done it!! 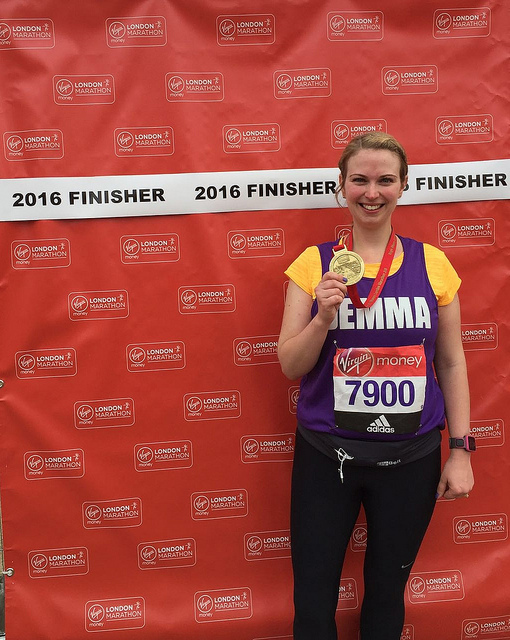 The girl who hated PE had run a marathon! After a quick trip to the loo, we posed for finisher photo’s and I was all a bit wobbly. I felt like just lying down! I didn’t has we had to meet with with Simon’s parents to collect Oscar before we headed back to the hotel. The trip getting back to the hotel, took ages. We’d not taken into account that a lot of the roads were closed. We finally made it back to be greeted with hugs from my proud parents (my Dad cried!) and glasses of champagne – cheers (although despite my best plans, I only managed 1 and a half glasses, before I needed a bath and bed!)! All in all, one of the best days of my life. Definitely up there with getting married and having my kids. The sense of achievement was out of this world. I ached a lot for about three days afterwards and my foot and knee are still hurting, but they’ll heal! Will I do it again..? Absolutely! I want to smash the hell out of those last 6 miles next time!!! In fact, I’ve already entered this year’s ballot!